Well, the last exposed snow as now gone. 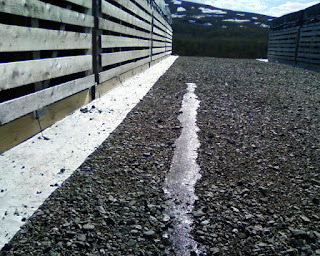 This photograph was taken yesterday and shows the last tiny patch of ice between the HBA tiles. There is actually still a bit of ice under the tiles, which will no doubt remain for a few more days yet, but with the heat wave we have had the snow this year has disappeared very quickly. There is still snow on the mountains and there is a still ice on the lake, but they too are starting to vanish.